"In the town of Crocker they didn't play soccer. They lived it." The title of this one says it all; it's about a cute dog who can play soccer. Not only that, but said pooch also teaches a lonely boy a valuable life lesson in the process of the story. While this may not be the most dramatically challenging film I've ever seen, it does come across a little better than the typical sugary schlock that passes for second-tier "family" films, even if a little predictable and safe. There's nothing wrong with predictable and safe, mind you, it's just that my naturally jaded personality kicks in when any movie features a "big game", a lovable mutt, and a misunderstood orphan. I went into this DVD expecting the worse, and was pleasantly surprised when I caught myself actually laughing a few times.Alden (James Marshall) and his wife Elena (Olivia d'Abo), who sport a massive house on his DMV employee salary, adopt 12-year-old Clay (Jeremy Foley) from the gothically dark Pelton Orphanage. As we learn in the opening narration, Alden also came from the very same orphanage, and he used soccer as a sort of focal point to get past the unpleasant times there. Of course he expects his new son to have the same love of the game, but that just doesn't seem like it's going to happen. It takes an encounter with a scruffy runaway dog with the ability to move a soccer ball around to change the boy's life, and teach him a little confidence. Clay names the dog Lincoln, and the pooch becomes the star of the Pee Wee soccer team, too. But you probably already knew that, just based on the film's title.Director Tony Giglio plays this one pretty much by the numbers, and includes the requisite clichéd plot devices to push the story forward, and the supporting cast appears to have fun with the rather limited script. Sam McMurray (The Tracey Ullman Show) is pretty funny as Coach Shaw, and his habit of calling the players by girls names made me chuckle a few times. Billy Drago is the film's heavy, as the villainous Dog Catcher who spends the film relentlessly tracking Lincoln.The big question is: will kids like it? My only barometer is my often referenced 10-year-old daughter Sammy, and she seemed to laugh quite a bit, despite having some reservations at first. McMurray and Drago are fun to watch, the dog is cute, but d'Abo is much cuter. 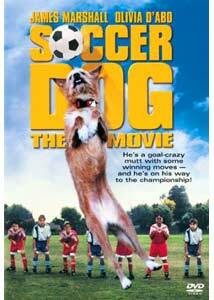 Image Transfer Review: Columbia TriStar has released Soccer Dog: The Movie in a 1.33:1 fullframe version. I know I shouldn't pick on a kid's title too hard, but I found the color transfer to be a bit inconsistent. Indoor scenes suffer from overly red fleshtones, with some noticeable fine grain. Colors in the daylight scenes,though, are well-saturated, and appear natural and lifelike.Kids will think it looks just fine. Audio Transfer Review: The 2.0 English surround track doesn't get too fancy, and is primarily centered across the front channels. Dialogue is mixed well, and is clear at all times. Occasional music cues fill out the rear channels, adding some depth to the soundstage. No real imaging is present, but the sound mix is more than serviceable.Spanish and Portuguese 2.0 surround mixes are also provided. Extras Review: Aside from decent chaptering, three animal-themed trailers (Stuart Little, Buddy, Fly Away Home) are the extent of the extras. There isn't anything new here, but this is harmless family fluff that might catch you off guard. Worth a family night rental.